Many say he is the next big thing, and no one is going to argue. YVES VANDERHAEGHEN interviews the sensational South African tenor, Levy Sekgapane, who is enchanting lovers of opera in Europe. “I’ve got to be great,” says Levy Sekgapane. “These people come for Non più mesta,” the final pyrotechnical aria of Count Almaviva, in Rossini’s Barber of Seville, “and I can’t disappoint them”. 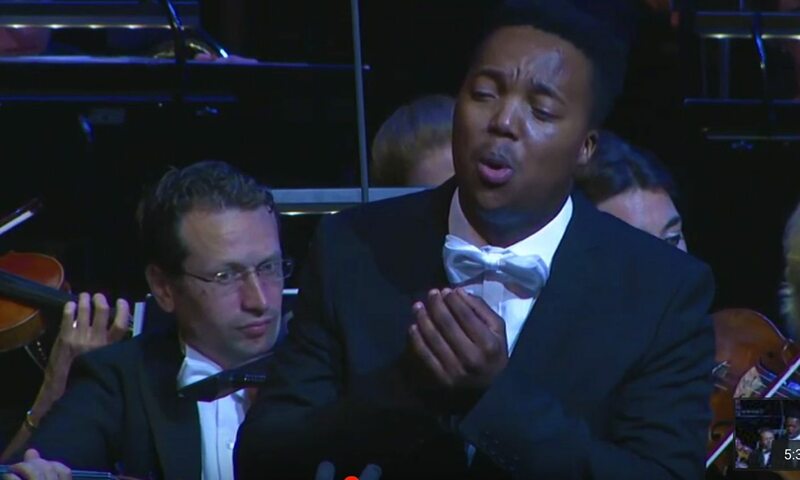 Sekgapane is still flushed from the success of the previous evening’s premiere, in Krefeld, in Germany’s glum Ruhr Valley, where the audience was roused to a boisterously drawn-out standing ovation for the young South African tenor. Germany is home to a third of the opera premieres in the world, and its audiences are notoriously hard to win over. Sekgapane on the other hand is eager to please. The music critic Shirley Apthorp, who has travelled five hours from Berlin for the show, tells me that Sekgapane delights in putting in all the embellishments, and in holding the hard notes just a little longer than is needed, because he likes to treat his audiences. And as for that aria, I’m told it is often cut, because it’s too difficult for most tenors. A graduate of the University of Cape Town Opera School, Sekgapane is clearly up for it, and it’s paying off with a string of awards. He says that winning the Mimi Coertse Singing Competition, in 2013, gave him the confidence to believe he could make it on the world stage. This year he won the Belvedere singing competition in Amsterdam, in which three of the new wave of South African singers were finalists, the Montserrat Caballé competition in Spain, and the Southern African Music Rights Organisation’s Best Western Art Music singer prize. The boy from Kroonstad wears his laurels lightly, as he orders a chicken wrap in the Grill Pallast restaurant, near the Krefeld station, as we chat. “No spices,” he tells the waitress. “Gives me reflux,” he says, “and that’s not good for my throat”. There is the fun part. He gets to travel, which he loves. Ever the cosmopolitan, this lover of baroque, and Bach, especially, is thrilled to be able to observe, in Barcelona, “Ah, the Spanish do this,” or in Dresden (where he has a three-year scholarship) “Ah, the Germans do this”. It is in Barcelona that he wants to buy a house, “when I’m rich”. I ask why: “Ahhhh, the weather”. Snow’s fine, “I love it”, but Barcelona has sun “like nowhere else”. Sekgapane has no illusions about this, but he’s got everything under control. He is only 25, but says “I’ve planned out everything myself. I know where I want to be, and I know what I need to do.” He will do Rossini for another 15 years or so, while he’s young. “Then some more French bel canto to preserve my voice for a bit longer, and then I will take on Verdi, who really pushes the voice.” He considers himself lucky that he is not being pushed beyond his limits by either his agents, or his mentor, the South African director (himself a tenor) Kobie van Rensburg, who also directed the Krefeld performance. There are also things that keep him grounded. One, he says, is his faith. “I take on only what the Lord brings my way”. Another is that he nurtures the Sotho in himself. “I get to speak Sotho on the phone to my brother, and that’s important …. as you know, you can take the man out of the ’hood but you can’t take the ’hood out of the man.” And when he gets to setting up his flat in Dresden, he is looking forward to getting channel TV, to pick up South African programmes, “especially Generations and Isidingo”. All this, he feels, keeps him true to himself. And that’s very important. What he values most, apart from loyalty, is “to be as honest as possible. Be true. Always tell people who you are, so that they know ‘he’s honest, he’s natural’.” In the same vein, when talking about the promising singers coming out of South Africa, he says “they have to use what they have, and be proud. We are not proud enough of what we have, and the country is losing good people”.